Before putting a lot of efforts into researching and understanding Invisalign, you should first determine if you are a good candidate for the treatment. The most reliable way to do this is to ask an Orthodontist, they are the experts when it comes to teeth alignement and you should only rely on their advice. If you want to find out if you’re a good candidate for Invisalign before spending time and efforts researching this treatment option, fill the short form below and we will find an expert in your area that can answer any questions you might have about Invisalign. Answer a few quick questions and see if Invisalign is right for you. Which option best describes your status? Which option best describes your status?Just started researching about Invisalign.Would like to setup an Invisalign consultation.Already have an appointment for an Invisalign consultation. Use the slider below to preview the results you could get with Invisalign for each treatable conditions. If you are not sure which condition you have, please refer to the right sidebar for an explanation of each conditions that can be treated with Invisalign. Once you know, you can use the arrows on the slider below to preview the results Invisalign could provide to fix your specific condition. Each case is unique but generally speaking, Invisalign clear aligners can fix an overbite or deep bite. We can help you find an experienced Invisalign doctor near you who can confirm if you are a good Invisalign candidate. 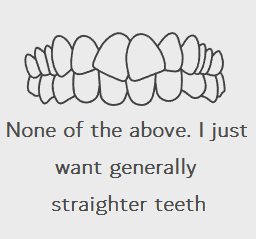 Each case is unique but generally speaking, Invisalign clear aligners can fix an underbite condition. We can help you find an experienced Invisalign doctor who can confirm if you are a good Invisalign candidate. Each case is unique but generally speaking, Invisalign clear aligners can fix a cross bite condition. We can help you find an experienced Invisalign doctor who can confirm if you are a good Invisalign candidate. Each case is unique but generally speaking, Invisalign clear aligners can fix a gap teeth condition. We can help you find an experienced Invisalign doctor who can confirm if you are a good Invisalign candidate. Each case is unique but generally speaking, Invisalign clear aligners can fix an open bite condition. We can help you find an experienced Invisalign doctor who can confirm if you are a good Invisalign candidate. Each case is unique but generally speaking, Invisalign clear aligners can fix a crowded teeth condition. We can help you find an experienced Invisalign doctor who can confirm if you are a good Invisalign candidate. Each case is unique but generally speaking, Invisalign clear aligners can fix most crooked teeth conditions. We can help you find an experienced Invisalign doctor who can confirm if you are a good Invisalign candidate. For everyone interested in Invisalign. You have an overbite condition if your upper front teeth close in front of the lower teeth. Your have an underbite condition if your lower teeth protrude past upper front teeth. You have a crossbit condition if your upper and lower jaws don’t line up. You have a gap teeth condition if you have extra spaces between teeth. You have an open bite condition if your top and bottom teeth don’t meet. You have a crowded teeth condition if there isn’t enough room in the jaw for teeth to fit normally.